Leading Manufacturer of hydroponics nutrients- gl-l green leafy (1 l), hydroponics nutrient- tv plus (master mix recipe) 1 liter, hydroponics nutrient- tv plus ( mastermix) 500 ml and hydroponics nutrient- gl-l green leafy (500 ml) from Mumbai. Green leafy vegetables require a balanced set of nutrition. Keeping the growth needs ofplant, higronics® has devloped Green Leafy™ GL-L.Green Leafy GL-L, a 2 part nutrient system has been developed to hydroponically growgreen leafy vegetables. GL-L nutrient mix is a unique blend of the macro and micronutrients which are well balanced and highly bio-available to aid growth of the plants.Leafy greens such as lettuce, bok choy, celery, arugula, kale, Swiss chard, mustard, spinachetc. can be grown using GL-L.If you want to grow pesticide free, healthy, vitamin rich foods, use GL-L.
Part 1 : TV PLUS™ MASTERMIXPart 2 : TV PLUS™ CALCIUM NITRATEVegetable formula for hydroponicsTV PLUS™ is a revolutionary nutrient mix developed for hydroponic growers. It comprises of two parts:Part 1, TV PLUS™ Mastermix which is a blend of all essential nutrients enhancing the overall growth andPart 2, TV PLUS™ Calcium nitrate that aids in efficient and fast absorption of nutrients. 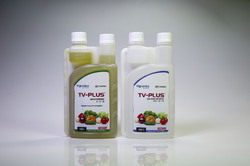 TV PLUS™ can becustomized and applied to plants during all stages of plant development to obtain an accelerated growthand higher yield.All you need to do is, mix the two parts and let TV PLUS™ do all the work. Looking for Hydroponics Nutrients ?